Coincident Versus Non-coincident Imaging Character: The following audio files compare the imaging qualities of coincident XY and non-coincident AB stereo rigs with similar acceptance angles (around 110 degrees). A loudspeaker was used to play back a snippet of the BBC shipping forecast from different soundstage positions in the following sequence: 0 degrees (centre); 20 degrees right; 50 degrees right (close to the right-hand edge of the acceptance region); 0 degrees (centre) again; 20 degrees left; and 50 degrees left (close to the left-hand edge of the acceptance region). This was recorded through two different mic setups: an XY pair of Avantone CK1 small-diaphragm condenser microphones (mutual angle 90 degrees) using their hypercardioid capsules (Ex09.001:WAV/MP3 ); and an AB pair of Avantone CK1s (spacing 30cm) using their omnidirectional capsules (Ex09.002:WAV/MP3 ). Notice in particular the sharper imaging and drier pickup of the XY array, and the greater spaciousness and more naturally extended low end of the AB pair. Balance, Tone & Depth Across The Acceptance Region: These audio files are designed to demonstrate how the choice of an XY array's mutual angle affects not only its acceptance angle, but also the balance, tone, and depth of sources within the acceptance zone. Again, a loudspeaker was used to play back a snippet of the BBC shipping forecast from different soundstage positions, and the result was captured with a coicident crossed pair of Avantone CK1 small-diaphragm condenser microphones (with their cardioid capsules fitted) using three different mutual angles: 90 degrees (Ex09.003:WAV/MP3 ); 110 degrees (Ex09.004:WAV/MP3 ); and 150 degrees (Ex09.005:WAV/MP3 ). In each case the loudspeaker was placed in relation to the array's acceptance angle (see Table 8.1 in the book) as follows: at the centre; at the right-hand edge; at the centre again; at the left-hand edge. Notice how the narrower mutual angle makes sources at the centre of the image louder, closer, and brighter than those at the edges; whereas the wider mutual angle makes sources at the edges of the image louder, closer, and brighter than those at the centre. By comparison, the 110-degree mutual angle maintains a more even sense of balance, tone, and depth across the whole width of the acceptance zone. Frequent Problems With Simple Dominant Arrays: Because many ensembles are captured from a frontal position, it's very common for a single dominant array to make the rear rows of players appear both too quiet and too far away, as you can hear in this example (Ex09.006:WAV/MP3 ), where a big-band's room microphones were unavoidably placed closer to the front-row saxophones than to the trumpets, trombones, and rhythm instruments -- a situation that was addressed in this case using additional spot microphones. Another increasingly common problem I encounter is people placing figure-eight XY pairs (such as the classic 90-degree Blumlein setup) too close to an ensemble so that some sources fall well outside the array's acceptance zone into the out-of-phase pickup region, as you can hear with the cymbals in this Blumlein-array drum overheads recording (Ex09.007:WAV/MP3 ). Not only does this make the out-of-phase instruments unnaturally wide-spaced in the stereo image, but also results in poor mono compatibility. Dual Dominant Arrays For A Fuller Sound: When recording single instruments, it's not uncommon to use two stereo arrays which capture different perspectives of that instrument's frequency dispersion to create a more appealing composite sound. For example, with piano you might combine an internal close pair (Ex09.011:WAV/MP3 ) with a further pair up by the edge of the lid (Ex09.012:WAV/MP3 ) to get a better blend of definition and natural overtones (Ex09.013:WAV/MP3 ). This same principle can also apply with ensembles, as in this instance where two sets of overhead microphones were used to mic up a drum kit from different angles within a highly damped acoustic: a spaced pair behind the drummer (Ex09.008:WAV/MP3 ) and a coicident pair at the front of the kit (Ex09.009:WAV/MP3 ). Although neither of these pairs present the cymbals particularly well on its own, together they create a much more representative tone within the context of the full-kit drum submix (Ex09.010:WAV/MP3 ). Dual Dominant Arrays For Dry/Wet Control: A very common reason for supplementing a simple stereo dominant array with an additional mic pair is to allow mixdown control of the recording's dry/wet ratio after recording. For this to work properly, you typically have to make the main pair a little drier than you might normally, as you can hear in this example (Ex09.014:WAV/MP3 ). The room mics in this case sounded like this (Ex09.015:WAV/MP3 ). This technique is extremely popular for drum-kit recordings as well, with comparatively dry, close-placed overheads (Ex09.016:WAV/MP3 ) being supplemented by more distant room mics (Ex09.017:WAV/MP3 ) so that the levels of these signals can be automated at mixdown to enhance the apparent dynamics of the performance -- for example, by riding down in the verses and up for the choruses. Coloration Of Off-axis Spill By Budget Large-diaphragm Condenser Mics: The following files demonstrate how the off-axis response of a fairly budget multi-pattern large-diaphragm condenser mic (a Groove Tubes GT57) colours spill pickup. A singer was set up 20cm away from the microphone roughly 135 degrees off-axis (in other words behind and to the right of it), and was recorded using each of the microphone's three polar patterns: cardioid (Ex09.020:WAV/MP3 ), figure eight (Ex09.021:WAV/MP3 ), and omnidirectional (Ex09.022:WAV/MP3 ). I've evened out the levels between the files to make them easier to compare tonally, and you can easily hear how much more coloured the cardioid mic's tone is than that of the figure-eight or omni. Spot Mics For Balance Correction: The most common reason for using spot mics within a dominant-array setup is to adjust a balance misrepresentation within the dominant array's signal. For example, in this dominant array recording, the necessity of locating the singer in the organ loft caused her to be underrepresented in the balance (Ex09.023:WAV/MP3 ), so a spot mic was recorded (Ex09.024:WAV/MP3 ) in order to redress this imbalance in the final mix (Ex09.025:WAV/MP3 ). As is quite common, a little artificial reverb was used to avoid the spot mic's more direct sound pulling the vocalist too far forward in the depth perspective. Spot Mics For Tonal Adjustment: In this dual-pair dominant-array recording the cembalo felt as if it could benefit from a bit more tonal warmth (Ex09.026:WAV/MP3 ), simply because the instrument itself sounded rather thin acoustically. A smooth-sounding ribbon spot mic for the cembalo helped here, and using it up close also boosted the instrument's low end on account of the figure-eight polar pattern's strong proximity effect (Ex09.027:WAV/MP3 ). Mixing this spot-mic signal in with the dominant array lent the instrument's lower midrange the desired hint of unearnt flattery (Ex09.028:WAV/MP3 ). This kind of tonal use of spot mics has many applications, but it's important to scrutinise the dominant array's sound before placing the spot, so that you make sure the close mic delivers the necessary tonal character. For example, this drum overheads recording (Ex09.029:WAV/MP3 ) clearly needs a snare-drum close mic not only to give it more level in the mix, but also to enhance the rather mellow high-frequency content. Sadly, however, the snare close-mic signal on this particular multitrack recording sounded both unnatural and muffled (Ex09.030:WAV/MP3 ), and therefore required serious remedial work at mixdown! Delaying Spot Mics At The Mix: Here's a baroque ensemble concert recorded through an ORTF dominant array (Ex09.033:WAV/MP3 ). Because the extremely shallow stage required the singer to be well off-axis to the main pair, she was given a separate small-diaphragm condenser spot mic (Ex09.034:WAV/MP3 ), and here's the mix with that faded in (Ex09.035:WAV/MP3 ). However, this made the singer feel a little too close to the listener, so the spot mic was delayed 20ms at mixdown (based on measurements of the recording setup taken on the day) to roughly time-align it with the dominant array (Ex09.036:WAV/MP3 ). A touch of artificial reverb was also applied to it for similar reasons (Ex09.037:WAV/MP3 ). Equalising Spot Mics At The Mix: Here's a gospel-choir recorded through a three-mic 'curtain' dominant array, supplemented with a direct feed from the accompanying keyboard (Ex09.038:WAV/MP3 ). The vocal soloist was also given a close-placed large-diaphragm condenser spot mic (Ex09.039:WAV/MP3 ) to try to give her more presence in the upper half of the frequency spectrum. However, the mic's proximity effect also boosted the vocal's low midrange, making the singer's tone indistinct and woolly when the spot mic was mixed in with the rest of the ensemble (Ex09.040:WAV/MP3 ). Cutting these unwanted lower frequencies with an EQ on the spot mic dealt with this problem (Ex09.041:WAV/MP3 ), and a splash of reverb then helped place the singer a little further back in the mix (Ex09.042:WAV/MP3 ). Correction: On page 308, line 31, the UK pricing for the C414B-XLS should be around £650, not £1600 as printed. Schoeps Polarflex System: This clever system uses a dual-mic coincident array in conjunction with a special cross-platform DAW plug-in. Check out these great audio examples to hear some of the system's capabilities. Rycote Microphone Data Site: For detailed information about all the microphones mentioned in Chapter 9's two hypothetical case-studies, get yourself registered (for free!) at Rycote's fantastic Microphone Data web site. Critical Distance: For more information about measuring and using critical distance data for practical recording (rather than for acoustic design), try these articles from Sound On Sound magazine and the ProSoundWeb site. Background Reading & Case Studies Of Dominant-array Recording: The Sound On Sound magazine archives have plenty of good material here. 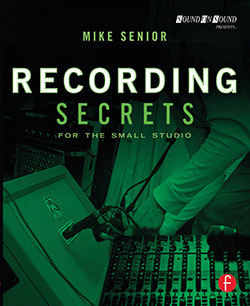 Hugh Robjohns's 'Stereo Microphone Techniques Explained' series is well worth a read (Part 1; Part 2) for a historical perspective on the technical side of things, and there are several articles which discuss case studies of this kind of recording in depth too: 'Session Notes: Duo Melodika'; 'Recording A String Section: Theory & Practice'; 'Recording Violin & Piano; 'Recording A Live Choral Performance'; and 'Recording A Choir On Location' (Part 1; Part 2). I'd also highly recommend tracking down the Delos-label recordings specifically discussed in John Eargle's The Microphone Book, because they add an extra dimension of usefulness to what is already one of the essential books on the subject. Using Artificial Reverb: Here's a fairly entry-level Sound On Sound archive article to get you off the starting blocks if you're new to reverb effects -- there's more than enough information about it in there for tracking purposes.